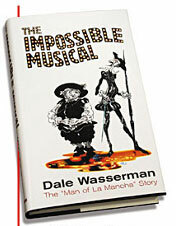 Dale Wasserman wrote for theater, television and film for more than 50 years and is best known for the musical Man of La Mancha, a multiple Tony Award winner. He also wrote the stage play One Flew Over the Cuckoo’s Nest, based on Ken Kesey’s novel, which has won several Tony Awards. Both shows continue to be produced nationally and internationally with an estimated 300 productions a year. In January 1979, Dale met Martha Nelly Garza, who became his wife, loyal partner and loving companion, as he quoted in his book, The Impossible Musical (2003). More than once, Dale commented that Martha Nelly was the best thing that ever happened to him (aside from MOLM) and that it was their 30-year partnership that had been the greatest contribution to extending his life and his talents to age 94. Together, they worked on numerous musicals and several new plays which can be found on this website under RECENT & READY WORKS. On December 21, 2008, Dale Wasserman, with his loving wife at his side, passed away peacefully of natural causes at his home in Paradise Valley, Arizona. Martha N. Wasserman is now the sole Owner/Licensor of Dale’s intellectual properties. A lively account of the career of the musical play which has touched the hearts and minds of millions.